Below is the first part of a short biography written of Jan (*1811) Vyborny in the Czech language by his son Vratislav. The text was discovered in the Czech archives at the University of Chicago and later translated by Laddie Kostel of Tabor South Dakota. Jan (*1811) was from the strong-minded and strong-willed branch of the Vyborny family from Libenice. His temperment comes through clearly in this excerpt. Jan (*1811) is the patriarch of a very large family, being the ancestor of many of the Wyborny's in the United States and possibly most of the Wyborney's. The author uses the Vyborny spelling throughout the text, although it is clear that Jan, in most circumstances, spelled the name Wyborny. Existing archive documents show Jan's year of birth to be 1811. This year is used below, rather than the 1806 that appeared in Vratislav's original manuscript. JAN (John) VYBORNY was born in the year 1811 in Libenice, Caslav Region of Bohemia, where he was raised, and in his 28th year he took ANNA RUZICKA as his life companion, and in their happy marriage had five sons and one daughter. However time passed, and his sons were growing up, as the eldest son was already 15 years old, and he was thinking of what to do when all his sons grew up, because he loved them very much and he knew very well that the government would quickly dress tnem into army coats. Although he did not have a higher education he nevertheless possessed a great inclination to observe and discover what is happening in the world. He especially was not a great friend of the priesthood, as he almost knew the entire bible by memory, which often resulted in scenes with the local Catholic priest so that at times he was officially put on report, as it is known, that this black mob leaves nobody at peace when things are not of their liking, or if sombody only slightly speaks up to them, perhaps defending his rights, and immediately he has unpleasantries. It also once happened through the baptism of one child, when the father was of the evangelic Protestant religion and the mother was a Catholic, and here the Catholic priest wanted to convince him to baptise the child to the Catholic faith, to which he very strongly objected; so that they had a rather unpleasant scene. Even though the priest did not attain his wishes, his vengeance was not finished and so he kept the father in mind. One time when he had a boil on his leg,and was hauling manure to the field, and at the same time a procession passed by, he walked bent over, limping along side the wagon, not uncovering his head. A short time after he was placed on report, stating that he behaved improperly toward a religious procession,and that he ridiculed it. This made him very angry, and he composed a song about them, which was immediately banned. During his stay in Bohemia he was also acquainted with Karel Havlicek, and read many of his writings. He subscribed to the "Slovan", which Mr. Havlicek published at that time in Kutna Hora, and which he diligently read-and brought all the way to America. In 1850 he resolved to leave Bohemia, which was difficult for him, but due to unbearable conditions of subjection his family also urged him, so his goal was the promised land, free America, to where he also urged Havlicek, but he would not concede, saying he would rather stay in Bohemia, where he would prefer to die for the benefit of the nation. Glory and honor to his spirit. At that time my father sold out his holdings, and in 1851 abandoned Bohemia. After 7 weeks on a sailboat of an unpleasant voyage, arrived successfully to New York, from where he set out at once further west to Wisconsin, coming to Milwaukee where he stayed for a while. The story of Jan (*1811) then continues for ten times the length of the text above. It describes the incredible hardships of those who settled the Great Plains in the middle of the nineteenth century and those who had the fortitude to overcome them. It is a tribute to the courage and perseverance of the common man. Jan Vyborny died in 1874. His wife had proceeded him in death by several years and in perhaps a softening of his religious views near the end of his life both are buried in the Catholic cemetary in Mitchell Iowa. 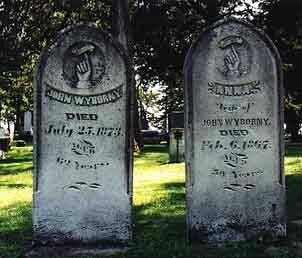 The name on their headstones is Wyborny.